Fifty years ago, Chevrolet introduced a car that would become one of the most revered vehicles in its sports car lineup. Code named XP-836, the Camaro was Chevrolet’s contender in what would become one of the hottest segments in the automotive industry. 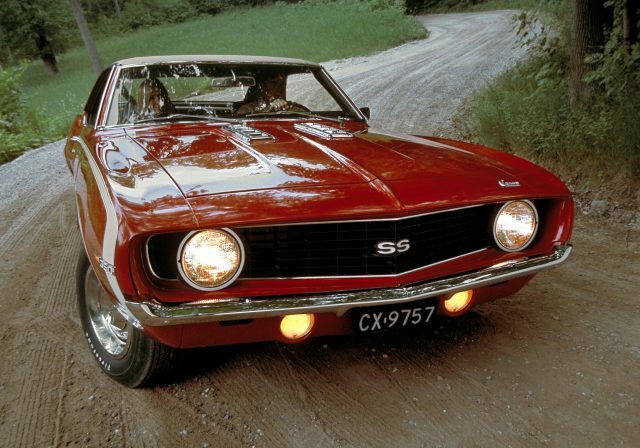 The Camaro was Chevrolet’s entry into the pony car market that was wildly popular in the 1960s. It’s been said the word Camaro is derived from the French language meaning friend or comrade. That’s a pretty fitting way to describe a car that’s been a companion with many of us for half a century. Let’s turn back the clock and look back at 50 years of classic Camaros. The Camaro was unleashed on the buying pubic on September 29, 1966. Buyers could choose from engines ranging from an economical 140 horsepower Turbo-Thrift 230 V6 all the way up to a 375 horsepower Turbo-Jet 396 V8. The Camaro was available in several trim packages, including base, Rally Sport, Z28, and SS. Customers who wanted an ultra-sporty car could even order the Rally Sport and SS packages together. The automotive press was relatively kind to the new Camaro. Car Life stated “CL testers can’t remember when they’ve had cars with such a high Fun Factor”. Car and Driver tested the Z28 and proclaimed “with the Z-28, Chevy is on the way toward making the gutsy stormer the Camaro should have been in the first place.” The buying public seemed to agree. Almost 221,000 Camaros were sold during its inaugural year. The Camaro got a makeover this year with new sheet metal and bolder styling. It was still available in base, Rally Sport, Z28, and SS trims. Chevrolet built two supercar versions of the Camaro in 1969. The COPO Camaro came equipped with a 427 V8 spewing 425 horsepower and 460 pound-feet of torque. The ultra-rare ZL1 was another weapon of choice that was popular with drag racers. It was also conservatively rated at 425 horsepower but actual power was closer to 500 horsepower. Several of the automotive aftermarket elite, like Nickey and Yenko, also worked their magic and created super Camaros. A popular model with enthusiasts is the Indy 500 Pace Car. Chevrolet created approximately 3,700 pace car replicas with engines ranging from a 300 horsepower 350 cubic-inch V8 up to a big-block 396 V8 with 375 horsepower. All pace car replicas came with white paint and Hugger Orange stripes. Collectors consider the 1969 model year to be one of the best years for the Camaro. With so many collectable models coming out this year, that should be no surprise. The 1969 Camaro even served as inspiration for the fifth generation’s retro design. The all-new second generation Camaro ushered in the 1970s with fresh, European-inspired styling and a completely redesigned interior. The new Camaro featured a long flat hood and short rear deck. Due to being introduced late in the model year, some aficionados refer to this year’s Camaro as being a 1970 ½ model. Front disc brakes also became standard on all models for 1970. And with six engine and four transmission choices, there was a Camaro for just about anybody that wanted one. One downside to the new Camaro was the convertible disappeared and wouldn’t be offered at all during the entire second generation. The Camaro went through a major refresh for the 1974 model year. The car featured a revised grille up front and triangular tail lamps out back. The most notable change was bumpers that stuck out like a sore thumb to appease Uncle Sam and added seven inches to the length of the Camaro. 1974 would also be the last year for the Z28 until its return three years later. The Camaro was available in Sport Coupe, Type LT, and Z28 trims. Production for the year was just over 151,000. The disco era was in full swing and sales were at an all-time high. A record 282,571 Camaros were sold during the 1979 model year. Not bad for a year when a second oil crisis occurred which drove up the price of gasoline and caused long lines at the pump. Chevrolet also introduced the Berlinetta with sales just over 67,000 units. And performance enthusiasts could still get a Z28 with a respectable 175 horsepower and 270 foot-pounds of torque. The third generation was released for the 1982 model year. And man was it radically different from the 1981 model. The new Camaro was 470 pounds lighter and 10 inches shorter than the previous Camaro. It featured a unit-construction body with a strut-type front suspension and live rear axle. The Z28 was crowned Motor Trend’s “Car of the Year”. The new Z28 was also chosen as the pace car for the 1982 Indianapolis 500. On the strip, the Z28 would run from 0 to 60 in 9.42 seconds and sprint the quarter mile in 17.13 seconds. The big news for 1985 was the introduction of the IROC-Z which got its name from the International Race of Champions racing series. It featured twin fog lights, black hood louvers, and body-colored ground effects. Buyers could choose from three V8s including the new 5.0-liter Tuned Port Injection engine with 215 horsepower. Car and Driver liked the new IROC-Z so much they placed it in their 10 Best Cars for 1985. Chevrolet celebrated the Camaro’s 25th birthday with a special Heritage Edition model. This special edition package was available on the RS and Z28 and featured a body color grille, special striping, and 25th anniversary badging. 1992 also marked the last year for the third generation. After a decade of production, the third generation was getting long in the tooth and somewhat dated. It was high time for a change. The fourth generation Camaro made its debut during the 1993 model year. The Camaro was all-new from the ground up and came in base and Z28 trims. Production also left the United States and moved to a new factory in Sainte-Therese, Quebec, Canada. The 1993 Camaro featured several Chevrolet firsts including the first Chevy to come with R-134a A/C refrigerant and the first Chevy to be equipped with dual airbags. The new Camaro Z28 was also chosen as the pace car for the 77th running of the Indianapolis 500. Car and Driver tested the Z28 and realized a 0 to 60 time of 5.3 seconds and a quarter mile run in 14 seconds running 100 mph. The LT1 V8, borrowed from the Chevrolet Corvette, was much more powerful than the Tuned Port Injection used in the previous Z28. The Chevrolet Camaro celebrated its 30th birthday with a special 30th Anniversary Commemorative Edition package. The package included Artic White paint with Hugger Orange stripes which mimicked the paint scheme of the 1969 pace car. The package also included white five-spoke wheels and white exterior door handles. Buyers could choose between solid white leather seats or white leather with houndstooth inserts. The package was available on the Z28 as a coupe or convertible and SS in coupe and convertible. 2002 was a sad year for Camaro lovers. After 35 years, Chevrolet discontinued production of the Camaro. Sales were way down over the last few years and Chevrolet decided to cease production. The last Camaro, a red Z28 convertible, rolled off the assembly line on August 27, 2002. It was the end of an era that had lasted over three decades. It was a bitter pill to swallow for the Camaro faithful. The good news is Chevrolet produced a 35th Anniversary SS to say goodbye to the Camaro. It featured Rally Red paint, checkered flag striping, custom wheels, and 35th anniversary badging. It was available as a coupe and convertible. Chevrolet introduced the retro-inspired Camaro concept during the 2006 North American International Auto Show in Detroit. The concept’s design drew heavily from the 1969 model with modern touches thrown in. It was officially announced later this year that the Camaro would be making a comeback with production commencing at the Oshawa, Ontario plant in Canada. The Camaro was back! The first fifth generation Camaro rolled off the assembly line on March 16, 2009. It was available only as a coupe in LS, LT, and SS trims. Several special editions, including the Transformers Special Edition, Synergy Special Edition, and Indianapolis 500 Pace Car Special Edition, were also available during the 2010 model year. The first 2010 Camaro with VIN number 0001 was auctioned by Barrett-Jackson in January 2009 to famed Chevy collector Rick Hendrick. After a long wait, the new Camaro was finally available. Even more great news was that Chevrolet didn’t stray too far from the concept’s retro styling. For a car that many of us thought was gone forever, 2010 was a pretty good year to be a Camaro fan. The Camaro celebrated its 45th anniversary with several more special editions being released. Standouts include the 45th Anniversary Edition, the Honor & Valor Edition, and the COPO drag racer. 2012 also marked the return of the ZL1 supercar. This modern-day interpretation of the original spews 580 horsepower and 556 foot-pounds of torque. At the time, the ZL1’s LSA 6.2-liter engine was the most powerful ever offered in a Camaro. It could go from 0 to 60 in four seconds and could run the quarter mile in 12 seconds. 2013 marks the return of the track-ready 1LE. The 1LE could be ordered on 1SS and 2SS coupes equipped with the six-speed manual transmission. The 1LE is easily identified by its matte black hood, front splitter, and rear spoiler. Black wheels also compliment the 1LE’s unique persona. Motor Trend flogged this bad boy and got a 0 to 60 time of 4.3 seconds and a quarter mile time of 12.7 seconds running 111.8 miles per hour. The package only set you back $3,500 on top of the price of the 1SS or 2SS. 2016 introduced the new sixth generation Camaro. Built on GM’s Alpha platform, the new Camaro is lighter and more powerful than the previous Camaro. Even though the new Camaro may look similar to the previous generation, approximately 70 percent of the car is new. The wheelbase is about two inches shorter and the overall length of the new Camaro is shortened almost two inches. This is also the first Camaro to be produced in the United States since the 1992 model year. And it’s the first Camaro since the mid-1980s to feature a four-cylinder as the base engine. 2017 has been a banner year for the Camaro. The Camaro celebrates its half century with a special 50th Anniversary Edition. This model features Nightfall Gray paint, unique wheels, and 50th anniversary badging. The 640 horsepower ZL1 also makes a comeback. This behemoth is available as a coupe as well as convertible. And for the first time, the 1LE track package is available for both V6 and V8 Camaros. The Redline package adds flair such as 20-inch black wheels with red accents, black painted mirrors, and darkened taillamps. It’s not the destination, it’s the journey. That old saying still rings true after all these years. For the last 50 years, the Chevrolet Camaro has taken us on many of life’s journeys. Think of all the road trips, cruises, and first dates we’ve had driving the Camaro. These are memories we’ll treasure for a lifetime. Here’s hoping there’s a Chevy Camaro along for the ride for the next 50 years.